Frantic Mama: What's in a Name? 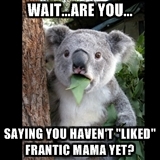 People often chuckle when I tell them my blog name, Frantic Mama. That's good. That's the point of the title-- to get us laughing. To acknowledge it ain't all wine and roses in parenthood, and that laughing is often the only way we can stay sane. How did I come up with the name Frantic Mama? I knew I needed to have Mom, Mommy, or Mama in there, as the blog was to center on Motherhood. My kids call me Mama, so that was simple. I honestly can't remember the exact moment when it dawned on me to add the Frantic part. It likely came to me in one of my random creative bursts (anyone else get those?). I thought it was funny and honest. Which, really, is the point of the whole blog. One thing people often ask is "so are you just FRANTIC all the time?" No, not all the time. Right now, in fact, I am thoroughly enjoying some peaceful writing time (with a beer) after getting the kids in bed. Am I frantic sometimes? Yes, of course I am! Especially those times when the kids and I are just getting home from an outing and one needs to poop, the other is peeing in her pants, they're chucking their shoes at each other, and they're both whining about being hungry/thirsty/and "not" tired. Those are the frantic moments. Transitions in general are tough on my kids and therefore tough on me. The moments when everyone needs something rightthatsecond make my heart speed up and my breath shallow and quick. This blog is supposed to capture those moments and relate them to you. It's also about positive thoughts I have on Motherhood-- the beauty and the beast. There is certainly joy and simple, non-glamorous beauty in my daily life as a stay-at-home mother to two little ones. I hope my blog communicates that in a way you can relate to. I want to offer a sincere thank you for reading and for sharing your own thoughts and stories along with me! And if you have just a few more seconds, please check out and "like" my recent essay, Parenting Like a Chimpanzee, up on Mamalode, right here! There is a quiet literary streak that is missing almost everywhere else. A lingering sweetness that I find adorable. Makes me want to come back for more because a thoughtful post doesn't just end where it does in words. Oh, thank you SO much for all of your kindness! Reading this when I first woke up this morning made my whole day brighter :).